Will Ferrell and Joel McHale join curator Aram Moshayedi for a tour of “Stories of Almost Everyone.” On view at the Hammer Museum, Los Angeles, January 26–May 6, 2018. First the trad artspeak version. The Hammer Museum - Stories of Almost Everyone (JAN 28-MAY 6, 2018) - Stories of Almost Everyone is an exhibition about the willingness to believe the stories that are conveyed by works of contemporary art. Listen to an audio guide written and narrated by Kanishk Tharoor for the exhibition. ArtNetNews | ‘Is It Weird? I Want to Eat It’: Will Ferrell Gets a Hilarious Lesson in Cutting-Edge Art at the Hammer Museum - The actor is joined by Joel McHale for a mock tour of the museum. Posted by Making A Mark on Friday, March 30, 2018 3 comments Who's linking to this post? 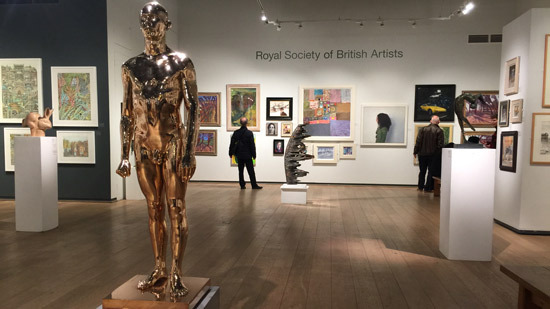 The 301st Annual Exhibition of the Royal Society of British Artists is significantly different to previous years. The RBA have noticeably "raised their game" and are all the better for it. I started off thinking this was a transformation of an exhibition - but in doing some homework prior to writing this post, I now realise its a complete transformation of the society as a whole. new Council members - again a complete change. 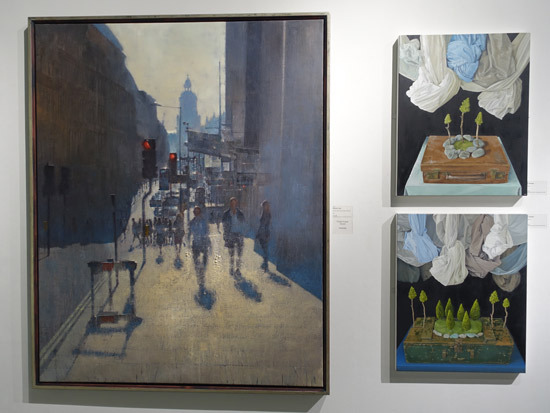 They also include Lewis Hazelwood-Horner who was invited to be a member after winning the Threadneedle Prize in 2016.
a very specific set of members for the Selection and Hanging Committee - rather than the "President and Council" - including three who are not members of the Council. 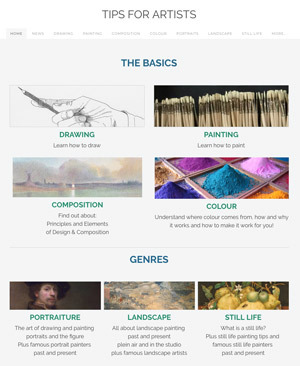 a new website - or rather one that's a very noticeable improvement on its previous incarnation. It looks "contemporary"- which is not a word that would immediately spring to mind in association with the RBA in the past. "Transformed" would be another appropriate word - it's now possible to get a very good look at the artwork in the exhibition. 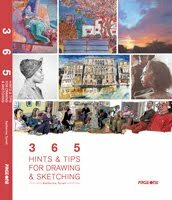 a record number of 174 works from the open submission - which is great news after my comments last year. 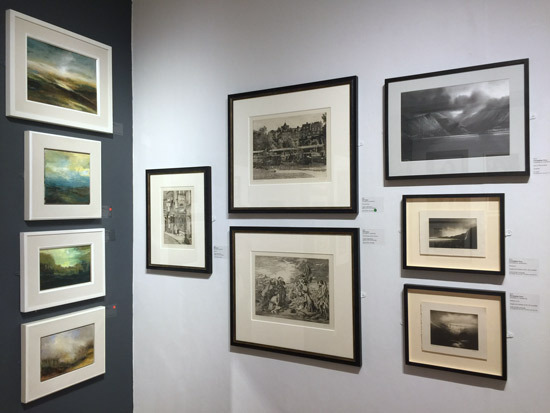 a much more impressive exhibition - it's got good and varied content with a diversity of styles - both traditional and contemporary - and it's well hung. 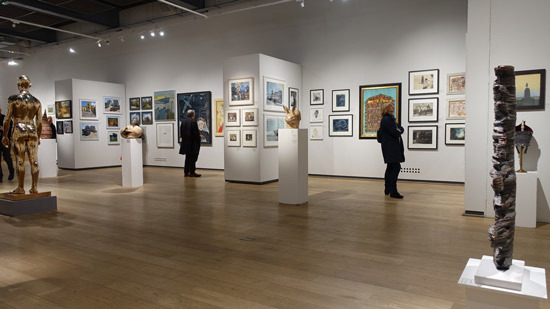 It's difficult sometimes to detect what's different - but in the last 10+ years of reviewing exhibitions at the Mall Galleries I know when a society has decided to change its image! 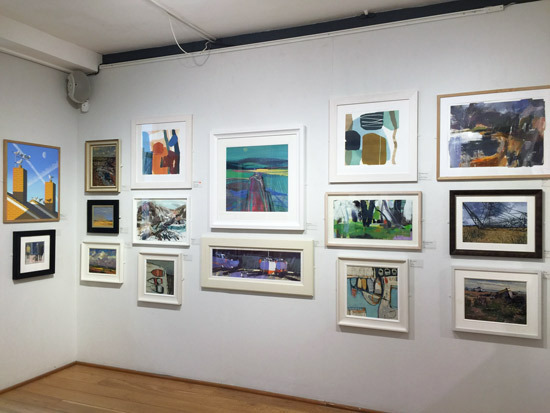 a very good record of the RBA Awards 2018 - and associated images - on the website during the course of the exhibition. This is something a number of societies struggle with - and I can never understand why. This is the major marketing opportunity of the year and those receiving awards should ALWAYS be celebrated. 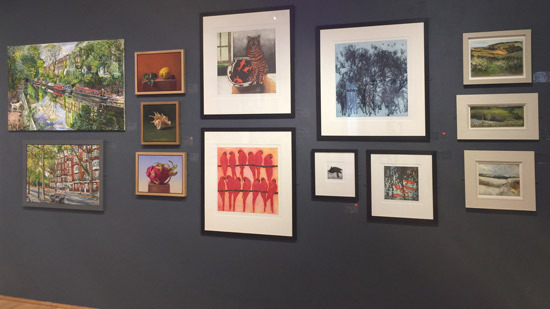 So well done to the RBA for doing the decent thing by their prizewinners - and including images of their work! steady and consistent marketing of the exhibition - on Facebook. It started well before the exhibition opened and hasn't stopped. Individual images from the exhibition have been posted each day. I wouldn't be in the least surprised if they've had some really good visitor numbers. I know it was surprisingly busy when I was there on Monday of the second week. In summary, the RBA has had a makeover and looks all the better for it! Every now and again, an art society needs a shake-up. It's simply not possible for the same people to be involved year after year without the society beginning to have a bit of a "same old, same old" look about it. 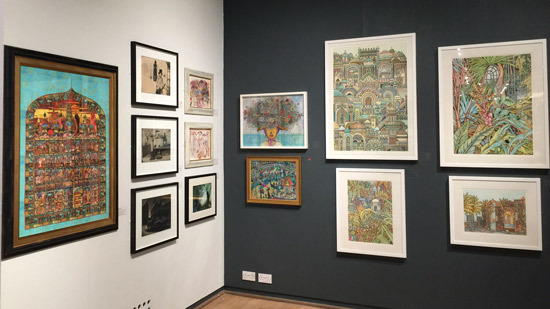 It's also really hard work keeping an exhibition looking fresh - because styles and contexts change - and the exhibition looks 'old' if not reinvigorated on a regular basis. However it's a lot easier if there is a change in the people selecting the work each year - and if there is a significant injection of new perspectives from the open submission. I think the RBA has done a really good job of thinking through what needed changing and putting resources, time and effort into getting the exhibition looking better. Open: Daily, 10am to 5pm during exhibitions (unless otherwise stated), including Bank Holidays. It makes a great start to the exhibition! I'm going to come back and add this in - or maybe even do a separate blog post - because I need to do some counting - and there's not been a lot of time for that this week. Nathan David Award for Sculpture AND The Marianne von Werther Memorial Award – Teresa Hunyadi – ‘My Pleasure’ - I loved this piece - and it had strong competition! Just amazing - I'm not in the least bit surprised it also won the Rome Scholarship. I also smiled when I saw her bio says she got her chainsaw licence last year! The Davidson Award for Oil Painting – Stuart Howitt – ‘Pandering to the Camera’ - or "Pink Panda" as I found myself calling it. The Surgeons Prize – Ruth Murray – ‘Fish Market, 100 Smirrells Road’ - strong unique style - and likes pink! Overall it gave the impression of being a little crowded. I don't have a problem with that so long as the exhibition is hung well - which this was. I loved this corner - lots to interest the eye and very detailed artworks and yet it's not too "busy"
I also particularly liked the sculpture on display in this room. In fact the sculpture across the whole exhibition was impressive. 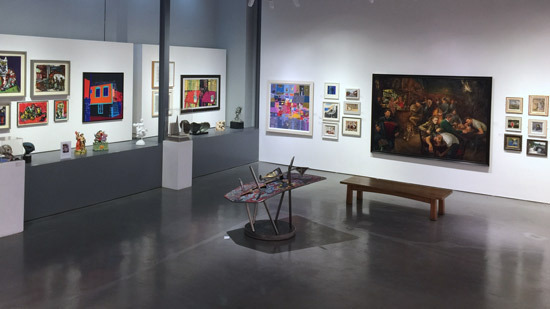 The North Galleries were again dominated by artworks from the Open Submission. A such they looked distinctly more contemporary than the rest of the exhibition. That's not to say there wasn't traditional elements within it. For me it included artwork which I wouldn't have expected to see in an RBA exhibition 2-3 years ago. Alex Callaway RBSA - has impressed me with his work in a number of recent shows. On the face of it traditional still life - but there's just something that gives it a contemporary edge. Plus he's getting selected for a good number of juried shows. Melissa Scott-Miller - Very steady painter of endless scenes of different bits of Islington. She has a major following. 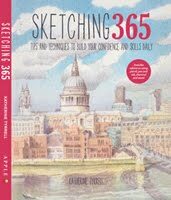 I think she's a really good fit - and will bring a bit of urban London - and colour - to the RBA scene. Will Taylor - I'm a sucker for traditionally drawn etchings of topographical scenes drawn in a traditional but not boring way - and he does not disappoint. Or maybe I just like Rye? Some of the pricing is very silly. 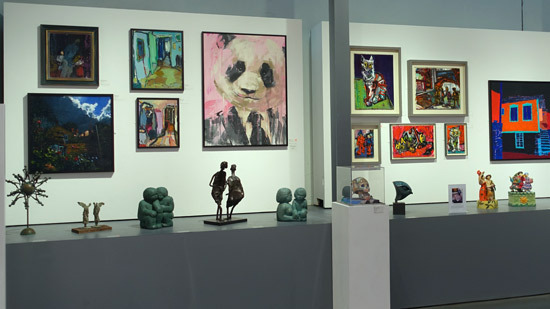 It doesn't help sales at the exhibition and it certainly does not help an artist's career. I'm beginning to think there ought to be a guideline offered with the information for artists submitting via the open entry. On the other hand some of that advice could do with being proffered to the members as well! 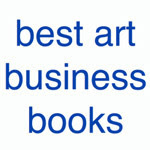 Some artists would do well to study who sells the most art consistently year after year after year. Annie Williams is a good example of an artist who consistently sells 75-80% of her work at most exhibitions and who has never ever been silly about prices. She knows her audience. Those who can price high are those who know they can price high and still sell. Posted by Making A Mark on Wednesday, March 28, 2018 0 comments Who's linking to this post? The Big Painting Challenge (Series 3) starts Easter Sunday! 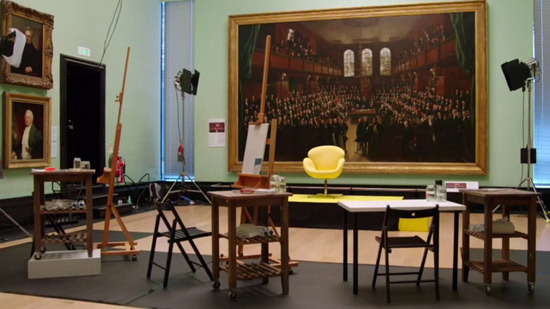 The return of The Big Painting Challenge to the BBC! The Third Series of The Big Painting Challenge kicks off next week. 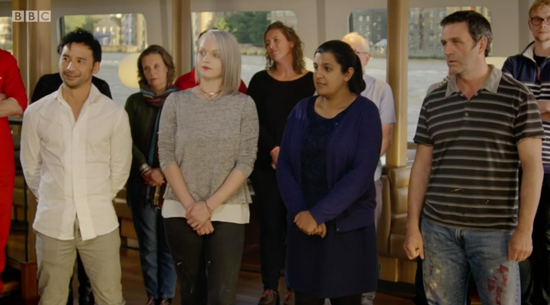 Mariella Frostrup and Rev Richard Coles return at 6pm on Easter Sunday to introduce "a six week artistic boot camp" as the BBC like to call it. It looks as if the Judges have returned to "normal" i.e. just Daphne Todd and Lachlan Goudie - which must mean I think that the BBC have read my comments on the third Judge from the last series - and doubtless there were other contributions on the same topic! There are going to be six episodes and it appears we are back to moving around the country. If precedent is any guide the series will cover the traditional genres of still life, portraiture, landscapes - rural and urban - and other aspects that build on previous topics and introduce an extra challenge eg wildlife and movement - followed by the Final in Episode 6. The episode runs from 6pm - 7pm on BBC1 (also available on iPlayer afterwards). a first painting involves objects they have brought from home. finally a painting of a large scale painting of the large-scale and shiny stills and fermenters used for producing whisky and gin in a distillery. 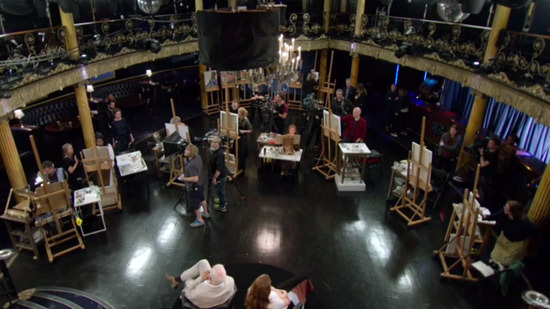 As in the last series, the paintings produced will be shown to a group of people - usually associated with the location - and determine the fate of one artist who gets an automatic pass to the next round. Finally, the judges pass their judgement - and decide who goes home. Next, I write my review of each episode and publish it on this blog as soon as possible after the programme! So expect a review every Monday for the next six weeks! I know both Judges and they are both very professional and very sound. 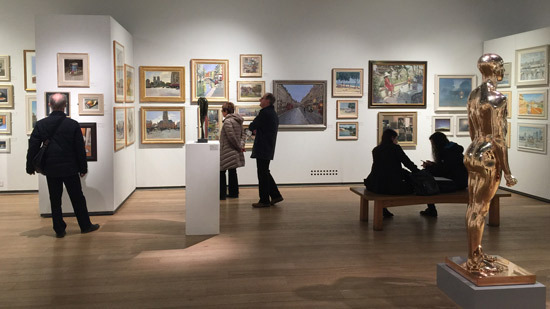 her last solo exhibition in Cork Street Daphne Todd at Messums - in which I analyse Daphne's paintings! 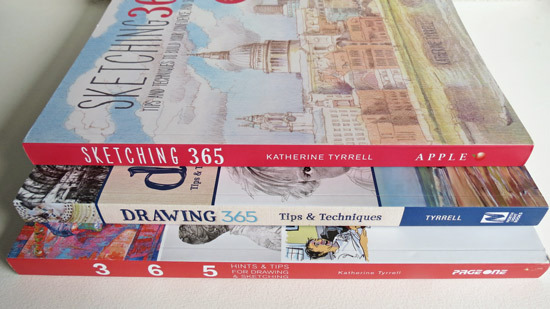 Below is a list of my Blog Posts for the previous two series of The Big Painting Challenge. Posted by Making A Mark on Monday, March 26, 2018 0 comments Who's linking to this post? Last night I spotted two images which for me symbolised the agony and the ecstasy associated with the judging of art competitions. 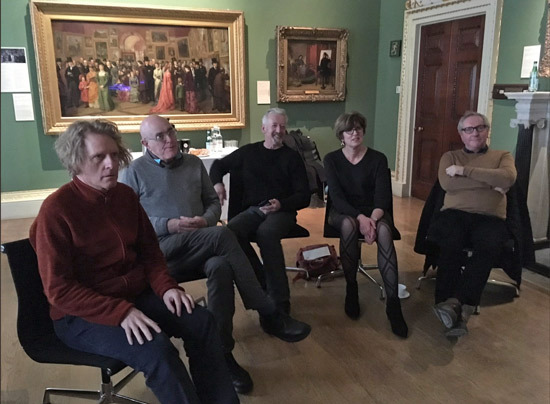 Agony - The faces of this year's selection panel for the 250th Summer Exhibition of the Royal Academy of Arts, led by Grayson Perry RA - who have just spent a week working their way through 15,000 artworks! The battle weary faces of five people who have looked at 15000 artworks since last Friday. Me with Humphrey Ocean, David Mach, Emma Stibbon and Chris Orr. Ecstasy - The joy of the artist who submitted work to this exhibition - and who got the nod - on finally seeing the letter that indicates her artwork has moved to the next round. Many thanks to Andrea Joseph for showing us what the missive actually looks like! 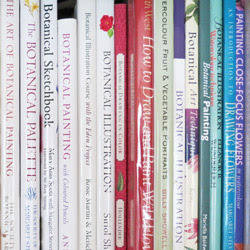 How long do judges spend on art competitions? 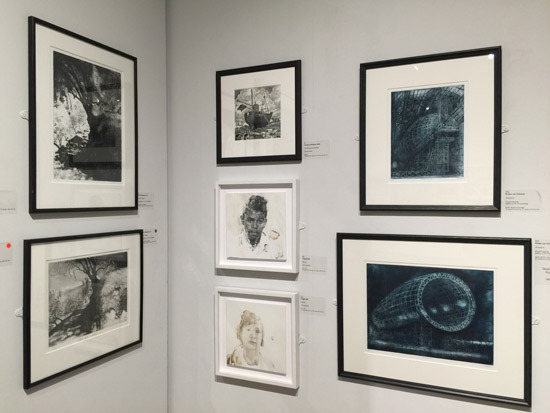 Many of the prestigious juried art competitions that I highlight on this blog disappoint something between 95-98% of the artists who have submitted work. That's an awful lot of people. in particular, how much time is involved in judging juried art exhibitions. 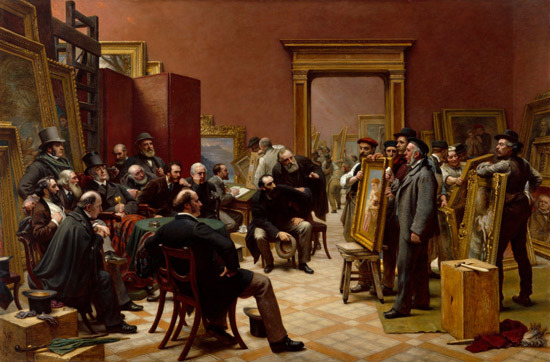 Below is a painting by Charles West Cope RA (1811-1890) about how pictures were selected for the Exhibition in 1875 - some 143 years ago. Some are still using a system which is somewhat similar (although smaller and in less grand surroundings). 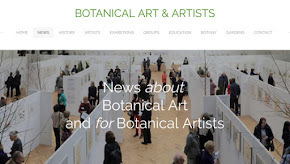 One of the main things that have changed since I started writing this blog is that now almost all art competitions have an initial digital submission. That makes life simpler for the competition organisers and cuts costs for both organisers and the artists submitting work. 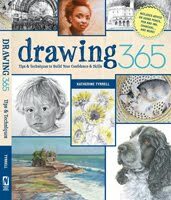 No more need to frame and hire a courier when instead all you need to do is learn how to scan or get a good photograph of your work. However, the other main feature of art competitions is that the number of submissions keep rising! Partly because it is now so much simpler to submit. So how does the assessment get done these days? First of all let's remember that many major art society exhibitions won't be paying for the time of members who get to be part of the selection panel. In relation to the more significant art competitions, I'm guessing that the practice varies. While some might be flattered just to be asked to judge, for other it's unlikely that they will judge without a fee being involved. I expect - but don't know for certain - that a number of the art competitions do pay a fee to their invited Judges. Mainly because these are people who are very busy with a lot of other commitments and their time may come with a fee attached. Why be concerned about time? Well let's take a look at what's involved in terms of time. I'm guessing it took either 6 days or 7 days to review 15,000 works and that Grayson Perry sat through the lot - with teams making up the selection panels for specific types of artwork. My question would then be...is this the best way to judge artworks? Accepted artworks then become those that hit you within the first millisecond...kind of what you would wish for in the world of advertising. But are we to judge artwork as you would a successful advertising mock-up or a catchy sound-bite? Are the energy levels of the judges consistent throughout this super speed processing machine? We're only human after all. Posted by Making A Mark on Sunday, March 25, 2018 1 comments Who's linking to this post? Posted by Making A Mark on Friday, March 23, 2018 3 comments Who's linking to this post? 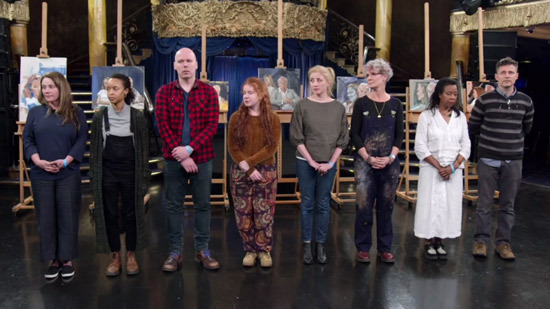 Last night was The Final of Sky Arts Portrait Artist of the Year 2018 - and this is a review of the programme and the decision. The Final Portraits painted in 4 hours. My guess as to who would win proved correct. The question up for discussion - in this post and any comments you might like to add - is whether or not the decision was justified. what happened in terms of the decision-making. 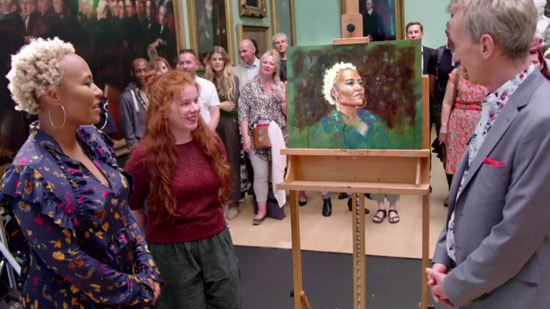 I think the three finalists were incredibly fortunate in having Emili Sande as their subject. She's got a "good head" and was incredibly still for four hours. I made notes while watching. both Danny and Samira gridded up - the latter for the first time. Hetty just stuck to her routine of starting with the eyes and getting those right and working out from there, measuring by eye as she went. Samira worried about using the grid as it seemed to throw out her timings. She looked quite tense and troubled by time. 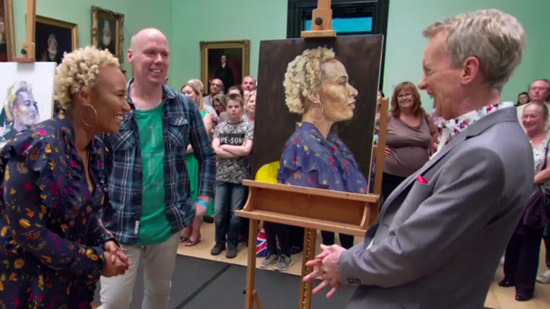 In terms of who produced the best portrait - in Emili Sande's view it was Hetty. 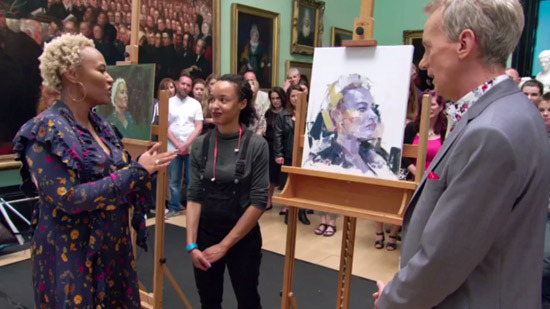 I liked the portraits produced by both Hetty (best likeness) and Danny - some lovely painting of skin tones, which is clearly something he is very good at. For me Samira seemed somewhat stressed having changed her normal way of working and while she definitely pulled it back towards the end, for me it wasn't one of her better paintings - although better than the one she produced for the semi-final where it was absolutely impossible to tell who the sitters actually were. I wish they'd given more time to the Commissions. If the decision is supposed to be based on both why not give them equal time? Posted by Making A Mark on Wednesday, March 21, 2018 21 comments Who's linking to this post? I've just spent a blissful 10 minutes watching a video about one Fred Cuming of my favourite artists. 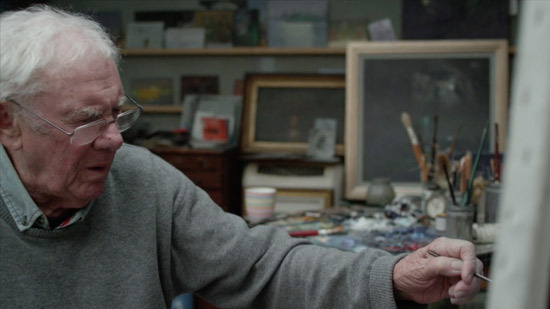 The video is called 'Fred Cuming RA: Portrait of an Artist' and was made in 2015 when he was 85. 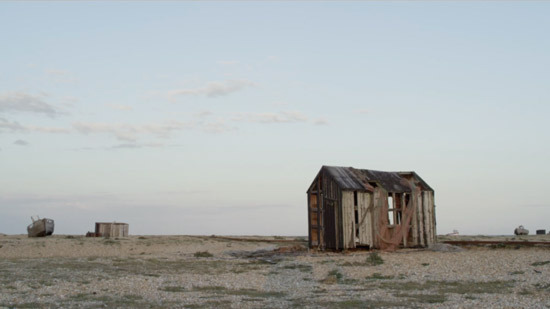 It was shot in and around his home and studio between Rye and Hastings in East Sussex. It's one of the more visually and orally articulate videos about an artist's work that I've seen in some time. 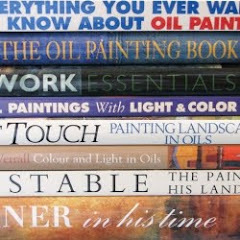 He's now in his late 80s and has been painting for over 60 years. 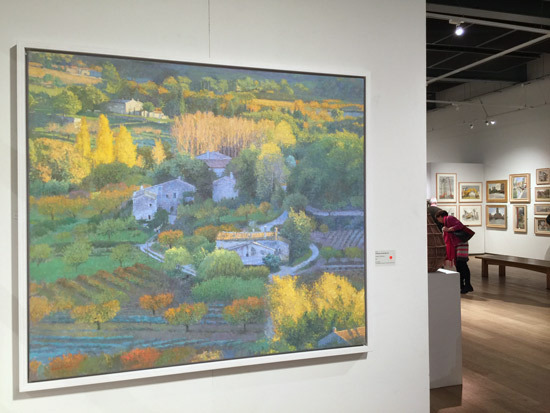 He paints real landscapes in an abstracted way with superb tonal control and fabulous colour sense. I love his cloudscapes, seascapes and snowscapes. 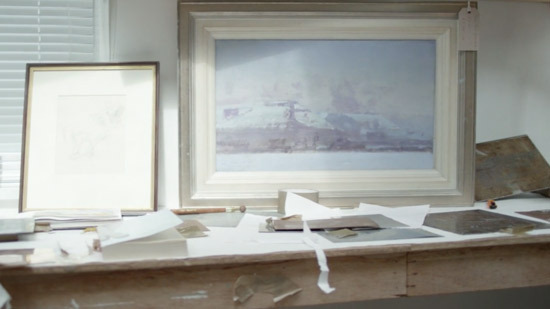 Fred has devoted his life to expressing the fleeting impressions of his surroundings, often painting the South Coast of England around Hastings and Rye where he lives. This is the video. I highly recommend you view the video in HD mode on full screen. 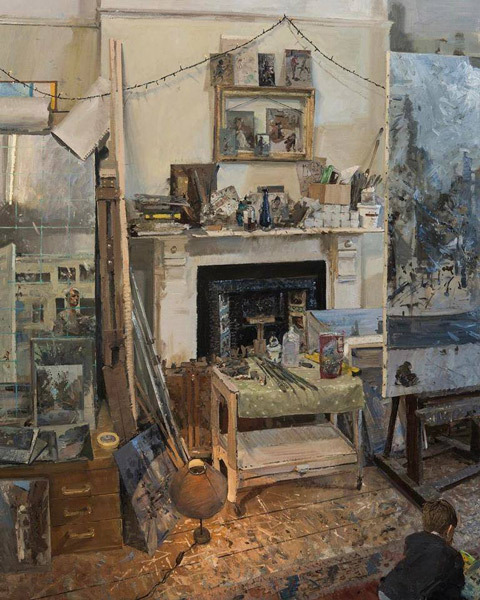 Fred Cuming painting in his studio shed. Fred Cuming RA will be exhibiting work with four other artists in 'The Alchemy of Paint' opening at Gallery 8, Duke Street, St James's on 21 May. Posted by Making A Mark on Monday, March 19, 2018 2 comments Who's linking to this post? The Travels of Atlantis Art Materials - on the move again! 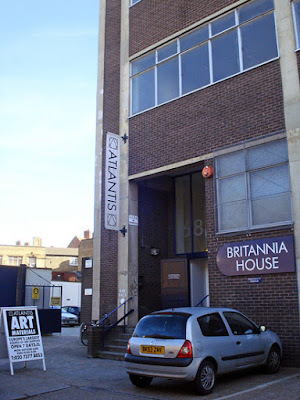 The largest art shop in London has moved again! 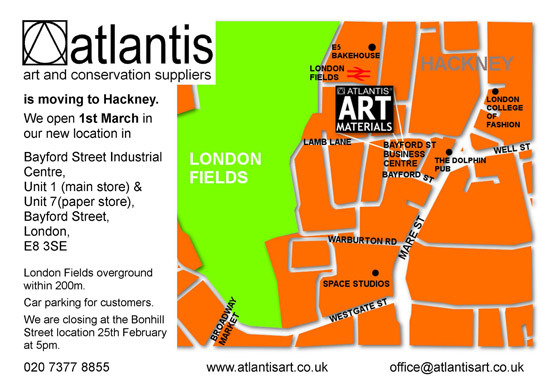 I regard Atlantis Art Materials as one of my local art materials shops. It's had lots of locations around the East End of London since I first encountered it just off Devons Road in E3 more years ago than I can accurately remember. I was idling trying to work out how many locations it has had since I've known them - and in the end came up with six - but I have only visited four of them. There again they've only been in the latest one in Hackney since 5th March 2018. 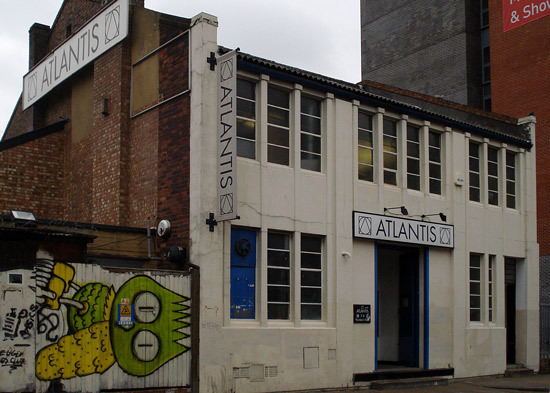 I'm sure this is the first place that I first I came across Atlantis Art Materials. I don';t think they'd been going for very long when I first came across them. It was a typical location for a company looking for a large building and not wanting to pay lots of rent! 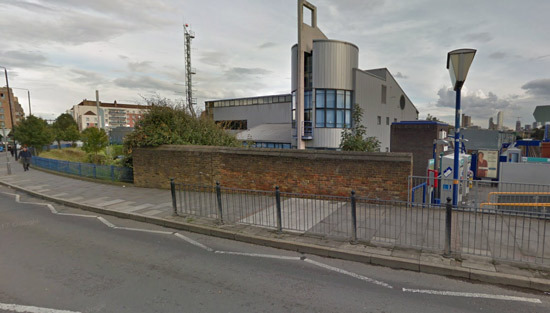 They inhabited a very modern techie type building next to where the Devons Road DLR Station (opened 1987) is now. This was by far the smallest of the stores. They got a lot bigger when they moved on from here. I don't think the DLR was open when I first visited it - but I could be wrong. The original Devons Road location. I seem to recall the building they were in looked different so it might have changed or it might just be so many years ago I can't actually remember. I can't remember the precise address but it was right opposite the Old Truman Brewery - in an HUGE warehouse with great parking. It was absolutely cavernous and one of the stores I liked the best. They were here for ages and I made lots of early purchases here. This was one of the best locations and was also very accessible whether visiting using public transport or by car. I could normally guarantee I could park the car either in their car park or on the street - which meant I could take my time and spend lots of money I hadn't planned to. Plus I really liked the layout and the paper desk - which was away from everything else. I have some very pleasant memories of having a wind down from work wander around on Saturday afternoons. They had to move on when plans for the area were developed and the site is now home to student accommodation. - especially when carrying stuff! This was a large bright space once you got inside and lots of space to display the products well. However the access was a total nightmare (particularly for those with mobility challenges) in terms of both stairs at the entrance, the store on the second floor and a lift that took forever - plus never enough parking spaces outside - plus controlled parking zone. Luckily I could park locally being a resident of Tower Hamlets - however I still had to time visits for when it was more likely there would be spaces! My shopping at Atlantis dropped off after they moved here - largely because of the accessibility reasons. It more or less became an emergency visits only - and I took to ordering online for larger stock supplies. The building is now a refurbished very modern and"funky" apartment block. 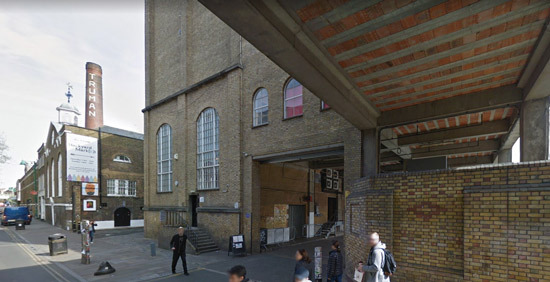 I've never visited this venue as I'd stopped being a regular customer after the parking problems associated with Hanbury Street. It never struck me as being particularly easy to visit - being in the middle of a gigantic one way system. This is their announcement. They've got two units in a business centre - Unit 1 for main art supplies and Unit 7 just for paper. double yellow lines everywhere - if you're not a Hackney resident don't even think about taking a car! no information on the website about parking - it's as if nobody ever has to move large or heavy items! 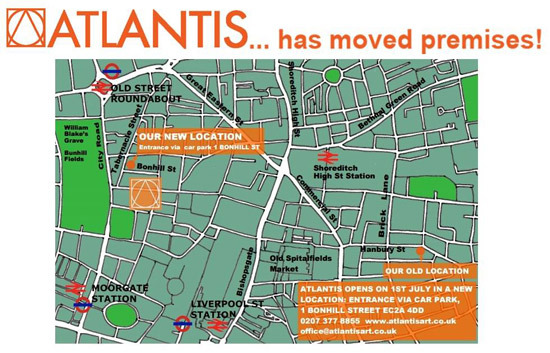 Atlantis have left Tower Hamlets - it's not local any more! and they've only managed 7 pics on Instagram so I wouldn't bother! Posted by Making A Mark on Sunday, March 18, 2018 2 comments Who's linking to this post? 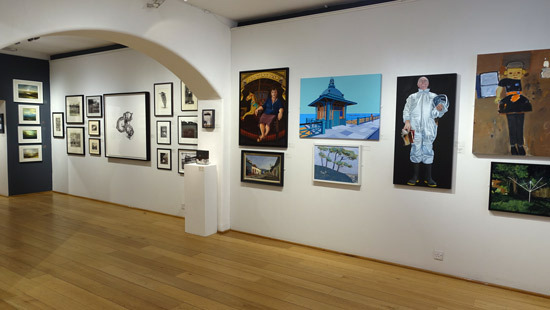 This week lots of people got their notification about their entry to this year's Royal Academy of Art Summer Exhibition. More than 95+% of them will have got a rejection email/letter. You are in very good company if one of those was you. "Dear Peter Brown, Thank you for submitting your artwork: NED READING ON THE STUDIO FLOOR. 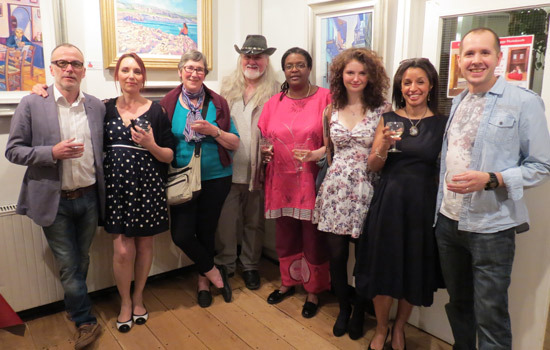 The Members of the Summer Exhibition Committee...regret that they will not be able to include your artwork..."
There have been HOWLS of disbelief on Facebook at this decision - 72 shares (and mine was one such) - and and very many comments - which I have idly wondered about analysing! 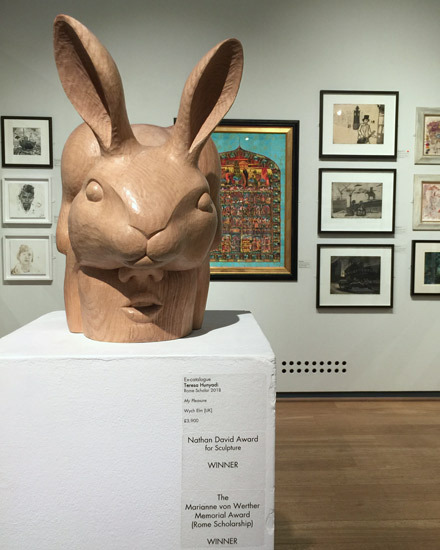 Last year I wrote a post called Does the RA Summer Exhibition still have the WOW factor? 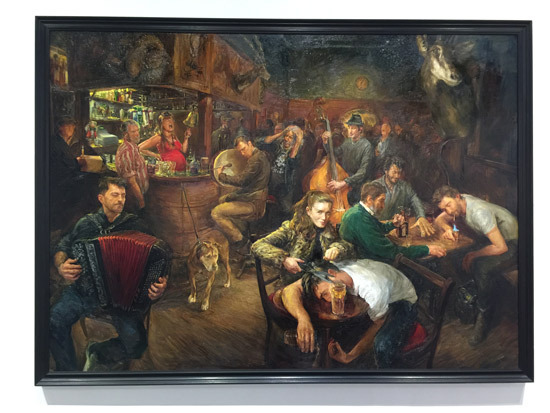 7. too few good figurative paintings - by which I mean of the relatively realistic variety. There were any number of the more fantasy oriented or "I can't draw" variety. 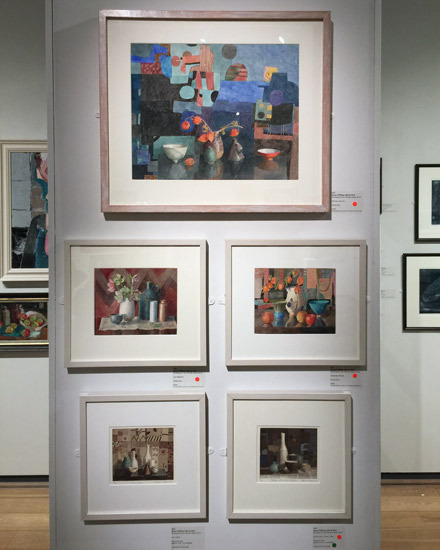 I see a lot more paintings I like better on a regular basis in the open exhibitions and art competitions exhibiting at the Mall Galleries. It's worth remembering that NEAC was originally set up by those who were disgruntled by the decisions of those running the RA! 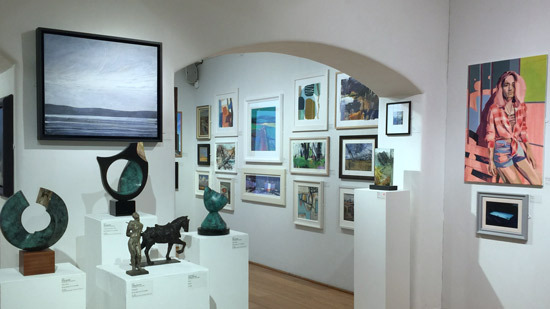 Call for Entries - RA Summer Exhibition 2018 - the 250th Anniversary one! Posted by Making A Mark on Saturday, March 17, 2018 4 comments Who's linking to this post? 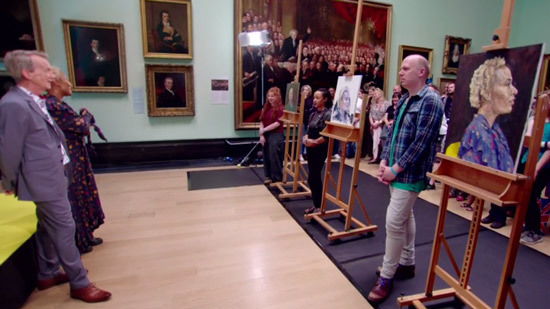 The Semi Finals (Episode 9) of Portrait Artist of the Year was broadcast on Tuesday evening. I was able to catch up on the programme, make my notes and review social media comments this morning - and what follows is my review. I'll see if I can make sense of what happened. In terms of looking back at the series as a whole it's interesting to see whether the choices made in the Heats survived the challenges associated with the Semi Final. First of all they changed the location. Using the Cafe de Paris was suggested to be a good way "taking them out of a safe environment" - although why an environment in which each artist probably had one of the more stressful experiences of their lives should be regarded by artists as "safe" is beyond me! It was also suggested that the nature of the environment would be something the artists could capture in their portraits. There are some very obvious reasons - see below why this was something of a ridiculous hope! Quite apart from the fact that most artists had stuck to head and shoulders portraits in their heats! 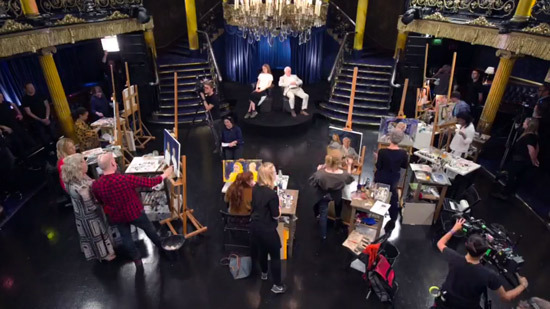 Instead of one, the finalists had to paint TWO sitters within four hours. NOT to notify them in advance - so they had a chance to practice doing two portraits in four hours (ie effectively halving the time they had previously). avoid any context or tactics which favours one artist over another. Could they have raised the stakes and been fair to all artists? Of course they could. I'd suggest this is something for the company making the programme to reflect on for the future. This is a slightly different review in the sense that we've already seen all the painters paint at least once. This week I got the impression that the major challenge for most people - besides two sitters in a new context - was the FACT it was the semi-final. The atmosphere was more intense and was commented on as such by more the one painter while others just looked more worried. I think a bit of performance anxiety crept in to some people's paintings. Certainly some painters paintings just fell away as the session progressed. They actually didn't look like they'd been painted by the same person who had painted in the Heats. For those focusing on keeping their cool and just working steadily - in order to keep a lid on nerves - there was the contrary issue of needing to remember all the time that they were painting two people and had to create a unity and balance between the two individuals - but in the same amount of time they had to do one person in the Heat! 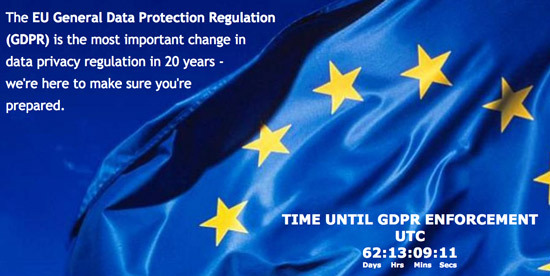 I thought Jonathan summed it up rather aptly "Why didn't I start panicking sooner?" - because at the end of the day there is always only a limited amount of time to get the painting done. Now this is a subject I know something about. My Drawing the Head class at the (what was then) Prince's Drawing School always had two sitters - and if you made sure to sit in a particular place it was perfectly possible to draw two models within the time allowed - which was 2 hours actual drawing time. Posted by Making A Mark on Thursday, March 15, 2018 0 comments Who's linking to this post?